University of Southern Maine President Glenn Cummings and Dr. Harold Osher announced an extraordinary gift — one of the world’s finest private collections of rare and historic maps and a new significant endowment — combined to become the largest gift in USM’s history and the largest ever to the University of Maine System. 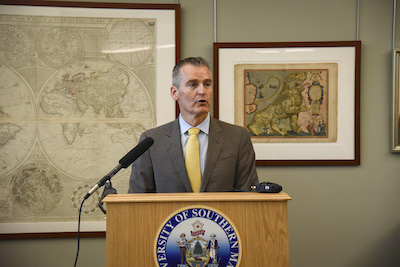 The June 22nd announcement is part of a transformative partnership to support the one-of-a-kind Osher Map Library at USM and maintain it as a dynamic and innovative educational resource for the people of Portland and all of Maine. Glenn Parkinson, an Osher family spokesperson, estimated the private map collection has a monetary value of $100 million. 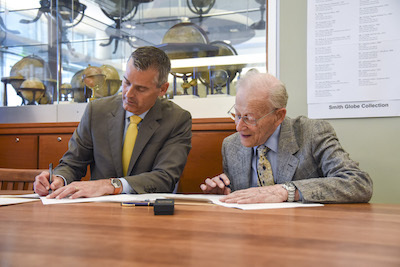 The new USM-Osher Map Library Foundation will be established with a significant gift to endow ongoing support for this expanded permanent collection at USM and its bold educational mission. The endowment will be combined with funds currently held by the USM Foundation on behalf of Harold and Peggy Osher. 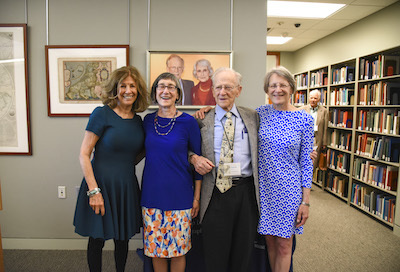 "The University of Southern Maine and the Osher family have enjoyed a longstanding, deep partnership in stewarding the growth and sustenance of this important and invaluable collection. Today, we are taking that partnership to a new level. Their gift will not only tremendously benefit our university, our communities, and scholars worldwide, but also serve as a lasting legacy of their extraordinary philanthropy and devotion to the people of Portland and the state of Maine,” said USM President Glenn Cummings. The collection includes such precious rarities as the 1475 map of the Holy Land, including illustrated Biblical scenes, which is regarded as the first modern printed map; the majestic and patriotically-inspired “Leo Belgicus” (Lion of the Netherlands), a circa 1617 map of the area which now includes the Netherlands, Belgium and Luxembourg; John Mitchell’s “Map of the British Colonies in America” from 1755, often called “the most important map in American history,” featuring the negotiated boundaries from the British defeat of the French; and also the very first map Harold and Peggy Osher purchased, an 1866 printed version of J.H. Colton’s 1853 map of Maine. In 1989, Harold and Peggy Osher donated their initial collection of world-class historic maps, charts and documents to the University of Southern Maine. In 1994, the university opened the Osher Map Library and Smith Center for Cartographic Education, and in October 2009, its new, expanded facilities opened at the corner of Bedford Street and Forest Avenue on USM’s Portland campus. Dr. Osher has added to this collection with additional purchases each year. The Osher Collection joins with 59 other collections of maps, globes and other cartographic materials that have been donated to the Osher Map Library and Smith Center for Cartographic Education. The Osher Map Library is cherished by scholars. 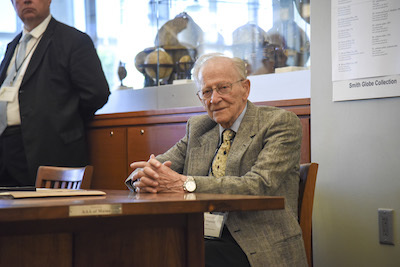 In fact, this week the library hosted the 2018 Symposium of the International Society for the History of the Map. David Rumsey, a renowned map collector and founder of Stanford University’s David Rumsey Map Center, praised the Portland resource. “The Osher Map Library is considered one of the nation’s premier rare map libraries,” he said. Matthew Edney, USM’s Osher Professor in the History of Cartography, agreed. “It is such an amazing joy to work with their collection and to handle stuff that you know is pretty close to what it was like 200 years ago or 400 years ago,” Edney said. To Harold Osher, maps inform many disciplines. The Osher collection joined the collection of the late Lawrence M.C. and Eleanor Houston Smith, and along with gifts from other individual collectors, the library has grown to encompass 60 separate collections, including exceptionally rare globes and more than 450,000 maps and historic artifacts. Libby Bischof, an associate professor of History and director of the Center for Collaboration at USM, cherishes the collection. “As a public historian, a visual historian, a Maine historian and most importantly a teacher, I can’t fully express how important this collection has been to my own professional growth and development as a historian and educator,” Bischof said. The collection will continue to educate generations, she said. “In a time when politics and border crossings are everywhere in the news, maps can really help us understand borders as creations, as human creations that can be done and undone. I think these maps are going to help a whole new generation of scholars understand where they came from and where they are going,” she said. More than 3,000 school children, from Kindergarten through high school, have visited the collection this year. "We are so proud to partner with Dr. and Mrs. Osher in fulfilling their significant commitment to the cultural and educational life of Portland. Their incredible foresight and generosity reflect their confidence in us, ensuring that USM will continue to serve as the great university this great city deserves,” said Ainsley Wallace, President and CEO of the USM Foundation. The announcement drew widespread media coverage. Read stories in The Forecaster, Portland Press Herald, Bangor Daily News, Lewiston Sun Journal and MaineBiz, and watch coverage by news stations WMTW-TV, WGME CBS 13 and Fox 23, and News Center Maine. The story also appeared on MPBN, and in the ArtDaily Newsletter and Philanthropy News Digest.